The conference registration fees and deadlines are listed in the table below. 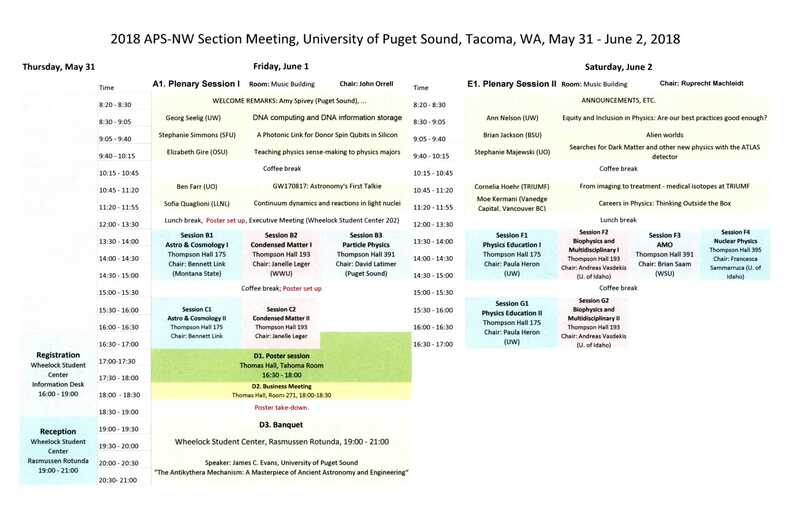 Attendees may register online via the APS conference registration page. After May 23, online registration will be closed until on-site registration begins at check-in time at 4 p.m. on Thursday, May 31, at the Information Desk in Wheelock Student Center on the University of Puget Sound campus. Attendees who wish to register on-site must pay by credit card or check (no cash payments). The local organizing committee encourages participants to attend the conference banquet. The banquet will be held at 7 p.m. on Friday, June 1, in the Wheelock Student Center Rotunda on the University of Puget Sound campus. A buffet dinner will be served (including salmon, wild rice, vegetarian options, and dessert), and each banquet ticket purchase will include one beverage ticket. The advance reservation price for the banquet is $40 per person for conference attendees and their guests. Reservations for the banquet may be made online on or before May 23 via the APS conference registration page. The after-dinner speaker will be Dr. James Evans, Director of the Program in Science, Technology, and Society and Professor of Physics at the University of Puget Sound. His talk will be entitled, "The Antikythera Mechanism: A Masterpiece of Ancient Astronomy and Engineering". More details can be viewed here. Please notify the conference organizers ahead of time if you will require special dietary accommodations at the banquet by emailing Neva Topolski (ntopolski@pugetsound.edu). The University of Puget Sound is located at 1500 N. Warner Street in Tacoma, Washington, USA. It can be reached easily via U.S. Interstate 5 and is located about 30 miles south of Seattle-Tacoma International Airport. Driving directions to the Puget Sound campus are given here, and a campus map can be found here. Information about airport shuttles, car rentals, bus service, and train service can be found here. Parking on campus is free, and there is generally ample parking available for guests in the summer months. Guests visiting Wheelock Student Center to check in should park in Lot P1 on the campus map. Guests heading to the morning plenary sessions in Schneebeck Concert Hall should park in Lot P4. Check-in for the conference will be available on Thursday, May 31, from 4-9 p.m., and on June 1 and June 2 from 8 a.m. to 6 p.m.. Participants should check in at the Information Desk in Wheelock Student Center on campus to receive their conference packets and room keys (if staying on campus). Attendees staying on campus who arrive after normal check-in hours can obtain their keys from Security Services at 3206 N. 15th Street (on the corner of N. 15th and Alder). Security Services can be reached by phone 24 hours a day at 253-879-3311. All conference attendees are invited to participate in the opening reception on Thursday, May 31, from 7-9 p.m. in the Wheelock Student Center Rotunda. Heavy hors d'oeuvres and non-alcoholic beverages will be served. The detailed schedule of talks and poster presentations can be found here. Details for talks: Plenary talks are allotted 30 minutes plus 5 minutes for questions. Parallel session invited talks are allotted 25 minutes plus 5 minutes for questions. Parallel session contributed talks are allotted 10 minutes plus 2 minutes for questions. Audiovisual equipment - The oral presentations will take place in rooms equipped with a digital projector, a computer running Windows, a VGA cable connection from the projector to a second laptop (if desired), and a pointer (either laser or physical). A lapel microphone will be available for the plenary talks in Schneebeck Concert Hall. Speakers who are able should arrive before their session and pre-load their talks onto the room computer via the USB flash drive before the session begins. Speakers who wish to use their personal laptops should bring their own adaptor cables, if possible. Speakers who will need to use sound from their laptop during their talk or require any other audiovisual equipment should email Amy Spivey (aspivey@pugetsound.edu) as soon as possible to request assistance. Details for posters: Although there will be a single poster session at the conference, there are two submission categories for posters: regular posters and posters presented by students. Posters presented by either graduate or undergraduate students will be automatically entered in the student poster competition, which includes a monetary prize. All presenters are expected to stay with their posters during the entire poster session time. Student presenters should be prepared for the poster competition judges to visit their poster and speak with them during the poster session. Poster size should be a maximum of 44 inches (112 cm) high and a maximum of 91 inches (231 cm) wide. Push pins will be provided for attaching posters to the poster boards. 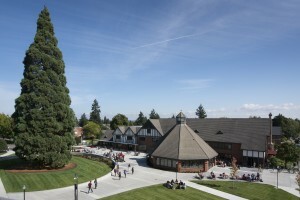 The on-campus room and board package includes lodging for two nights (Thursday, May 31, and Friday, June 1) in a single room in Thomas Hall, the newest on-campus residence at the University of Puget Sound. The plan also includes four meals: breakfast and lunch on both Friday, June 1, and on Saturday, June 2. The cost for this room and board package is $162 per person for registered conference attendees. More details about the accommodations in Thomas Hall can be viewed here. Questions related to on-campus housing can be directed to the local organizing committee by emailing Neva Topolski (ntopolski@pugetsound.edu). Conference attendees are welcome to purchase meals in the Diner, located conveniently inside Wheelock Student Center on campus (shown at the right). Attendees registered for the on-campus room and board package will have pre-paid for breakfast and lunch in the Diner for Friday and Saturday of the conference (June 1 & 2). Pre-paid meals are served all-you-care-to-eat style, with different menu stations, vegetarian and vegan options, fresh fruit and salad bar, selection of desserts, and self-serve beverages. Please communicate any special dietary needs with your conference organizers in advance, and they can notify Conference Services and the chef. Anyone on campus may also visit the Diner during open hours and purchase food items using cash or a credit card. On June 1 and 2, breakfast will be available from 7 - 9 a.m. and lunch from 11:30 a.m. to 1:30 p.m..
Graduate and undergraduate students planning to attend the conference are eligible to apply for a travel grant of up to $200. A limited number of travel grants is available. Preference will be given to students who are presenting their work orally or in poster form. Grants to offset childcare costs related to conference attendance are also available. If you are interested in applying for one of these grants, please contact the conference organizers by emailing Neva Topolski (ntopolski@pugetsound.edu). 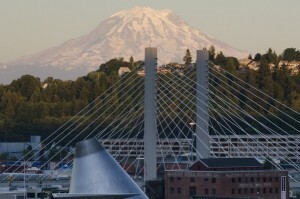 Tacoma has a number of excellent hotels and smaller establishments where guests may stay overnight if they choose not to stay on the Puget Sound campus. The conference organizers have negotiated special rates at two hotels. The University of Puget Sound's Office of Admissions has also compiled a longer list of nearby accommodations. Conference attendees wishing to stay in off-campus lodging should please make their own reservations. For questions, contact Neva Topolski, the Administrative Coordinator in the Physics Department at the University of Puget Sound (ntopolski@pugetsound.edu).